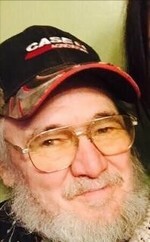 Obituary for Phillip Robert Zurbuchen Jr.
Phillip “Phil” R Zurbuchen Jr., 70, of Bangor, WI passed away peacefully on Thursday, October 26, 2017,. He was born on January 1, 1947, in Bangor to Philip R and Mary Doris (Loging) Zurbuchen. Phil lived and attended school in Bangor until he joined the Army in 1964, where he served in Vietnam. After his military career he worked in the construction industry for 35 years as an Ironworker, most of which was spent with Price Erecting. In 2003, after retirement from Price Erecting, Phil returned to Bangor to fulfill his lifetime dream of working and living on his family farm. Phil was an avid motorcyclist and held a lifetime membership with the Harley Davidson. He enjoyed spending time touring the country side and playing card games with his friends in the morning. He is survived by his daughter Patricia (Balford) Francis of Mequon WI; two grandchildren Abigail and Zachary Francis; his soulmate: Darlene Lobotzke; two sisters: Linda (Alfred) Huth of Ripon, WI and Nancy (Gary) Hammes of Onalaska, WI; step-brother Jim Erickson of Kenosha WI and numerous friends. He was preceded in death by parents and step mother Mildred (Erickson) Zurbuchen. Services will be held at 2:00 pm on Sunday, October 29, 2017 at the Fossum Memorial Center in Bangor, the Rev. Larry Olson will officiate. Friends may call at the Memorial Center on Sunday from 12 noon until the time of the service. Burial will be in the Fairview Cemtery in Bangor. Online condolences may be left at www.fossumfuneralhome.com. To send flowers to the family of Phillip Robert Zurbuchen Jr., please visit our Heartfelt Sympathies Store.